The La Ventana Challenge is the first triathlon of its kind. Participants compete in 3 different sports, Mountain Biking, Kiteboarding, and Stand Up Paddleboarding. The event will be held at ChiloChill Glamping Resort & KiteSchool located in La Ventana, Baja California Sur. The race is set up as a 3-part relay with 3 competitors on each team. 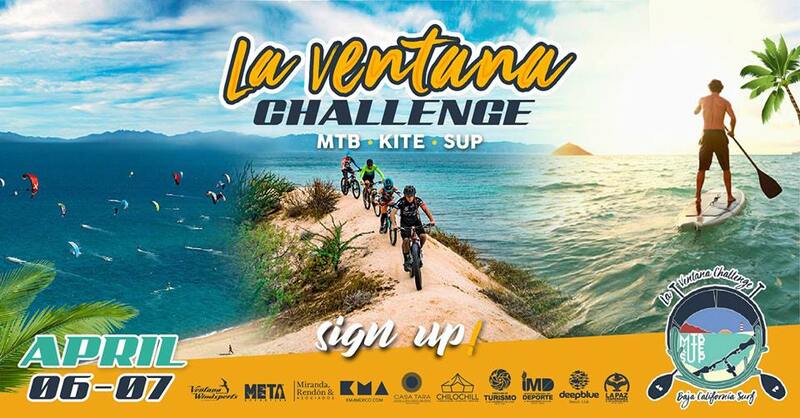 La Ventana Challenge is planning a lot of other surprise activities, as well as good music and a lively after party! Find more info at @ChiloChillBaja on Facebook! Gala de Danza recruits the most renowned dancers from across the globe to share the stage in Cabo San Lucas. The beautiful production created by Artistic Director and Founder Christina Lyon, transforms Viceroy Los Cabos into a global amphitheater with a wide array of musical and dance talents. Their website explains, “Gala de Danza is the heart of culture and art in Los Cabos, México. Since the summer of 2013, Gala de Danza has brought together artists from around the world to help enrich the lives of young dancers and the community. Dancers, choreographers and musicians from 20 different countries, have shared their talents in Los Cabos.” Tickets and VIP packages can be purchased at www.GalaDeDanza.com/tickets. 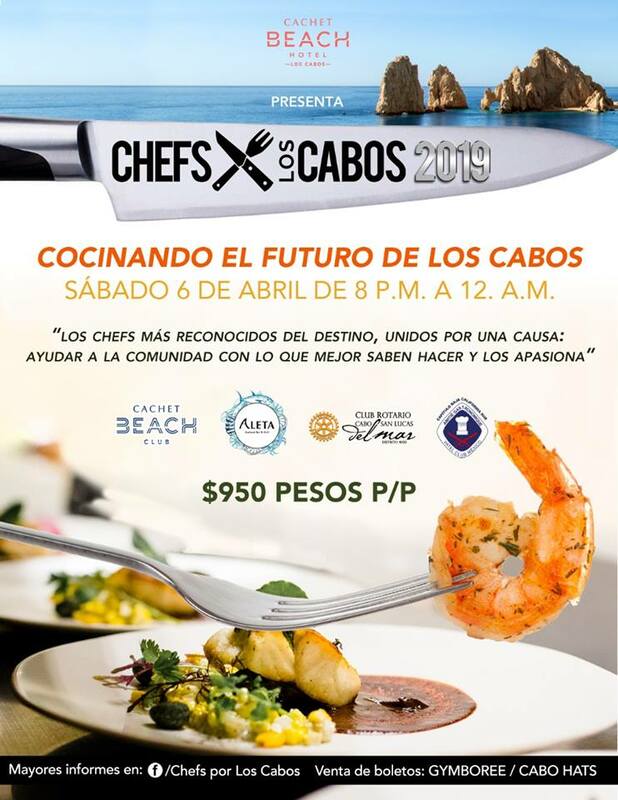 Cachet Beach Club will host Chefs X Los Cabos 2019, an exciting gastronomic event on Saturday, April 6 from 7pm-10pm. The most recognized chefs in the region will come together for a cause, to help the community and share the skills they are most passionate about. Tickets are $950 MXN per person and are available at Gymboree or Cabo Hats. For more information visit Chefs Por Los Cabos on Facebook. The Night Run ‘n’ Rock Half Marathon will take place on Saturday, April 6, at 7pm with the start and finishline at Marquez de León y Abasolo at the start of the Malecón in La Paz. Participants can choose from distances of 5K, 10K or 21K. Live rock bands will be distributed throughout the race making for an exciting run! The cost to enter is $450 MXN for the 5K & 10K, or $550 MXN for the 21K. Sign up in La Paz at Vélo Citti, Dinamic Publicidad or Thunders Bikes, in San José del Cabo at Tienda Triferrari or Thunder Bikes, or in Cabo San Lucas at Thunder Bikes. Find out more at www.timermexico.com! The Cabo Dance Challenge comes to the Cabo Cultural Pavilion on Saturday, April 6th. Dancers and dance groups from all over Baja California Sur will compete in dance styles like freestyle, teens, and soloists. Tickets are available at Green Apple Studio for $100 MXN. Visit @CaboDanceChallenge on Facebook for more information! 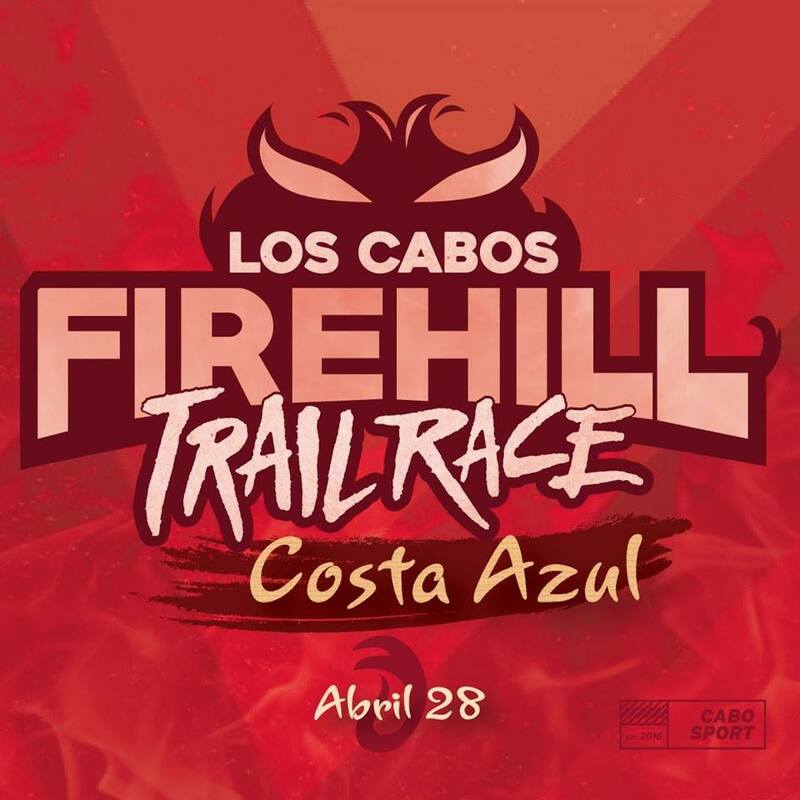 The 1stAnnual Sarahuaro A.C. race, in collaboration with Sorority Mexico and Ciclovía of Cabo San Lucas, takes place on Sunday, April 7 at 7:30am in downtown Cabo San Lucas in front of Pan di Bacco. Categories include 3K female, 3K male, 5K female and 5K male. All finalists will receive medals, and the first 3 places in each category will also receive trophies. Register at Koral Concierge for $200 MXN. 100% of donations will benefit the Sarahuaro A.C. Foundation. For more information contact Pamela Ávila at (624) 122-2460 or pamelasupyoga@gmail.com. 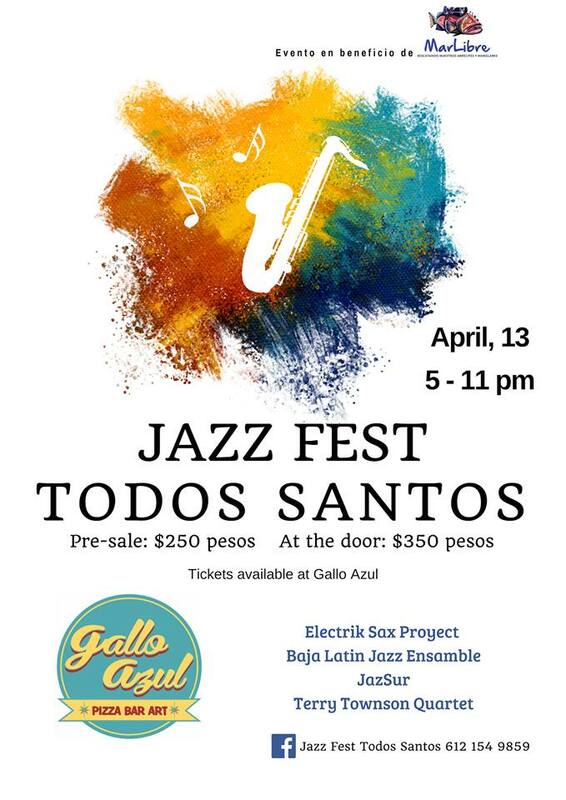 Jazz Fest Todos Santos will feature Electrik Sax Proyect, Baja Latin Jazz Ensamble, JazSur, and Terry Townson Quartet on Saturday, April 13 from 5pm to 11pm at Gallo Azul Pizza Bar. Tickets can be purchased in advance for $250 MXN at Gallo Azul, or for $350 MXN at the door. The event will benefit Mar Libre, a local environmental group that cleans reefs and mangroves and does school presentations education children about the harmful effects of marine debris. Visit Jazz Fest Todos Santos on Facebook for more information! The Cabo Spring Splash takes place on Sunday, April 14 at 7:30pm aboard Big Mike Sea Adventures private charter boat. Special molecular drinks will be provided by Arturo Brown with music by Djjaz Ramz, Dj Tavo & special guests! Sponsors include Jagermeister, Boost, Appleton Estate, Skyy Vodka, Aperol Spritz and Grand Marnier. Open bar and great music will make for an excellent night. Tickets at CaboSpringSplash.eventbrite.com. 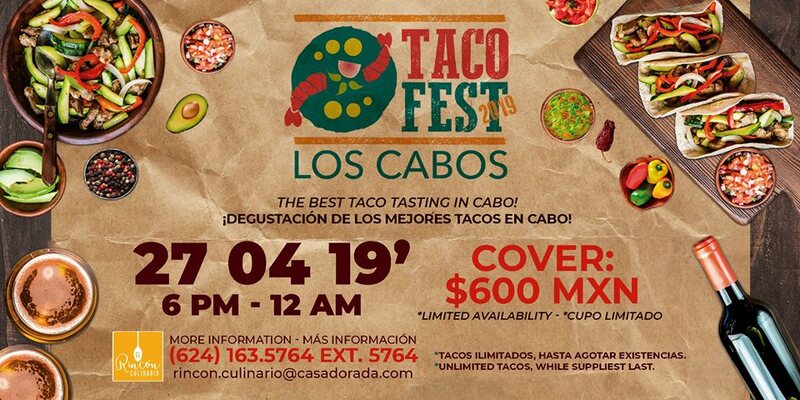 Come and taste the best tacos in Cabo at the 3rdedition of Taco Fest Los Cabos on Medano Beach in front of Casa Dorada Hotel Resort, on Saturday, April 27, from 6pm to midnight. The entry fee is $600 MXN and includes unlimited tacos while supplies last. Enjoy spectacular, panoramic views of the Land’s End Arch and Cabo San Lucas Bay along with the tastiest tacos in the Baja! More information at Rincon.Culinario@CasaDorada.com.